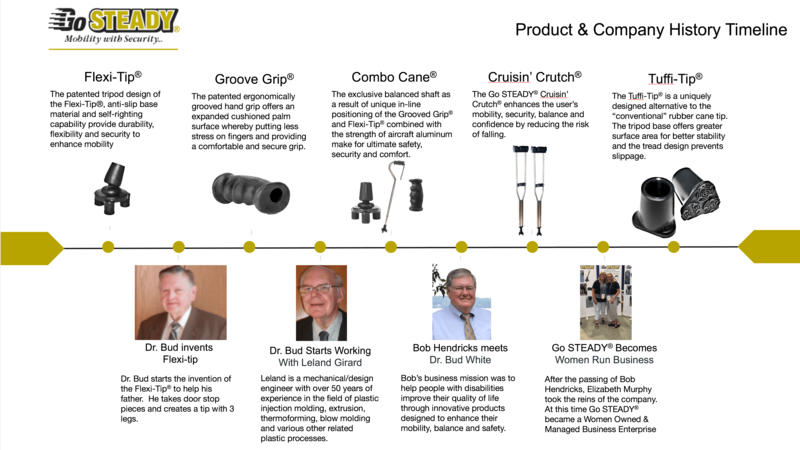 When Go STEADY®’s Founder Dr. Bud White’s father began using a cane. The cane did not provide the support his father needed and he kept falling. Bud’s creative inventor mind went into action thinking of how he could help his dad from falling. 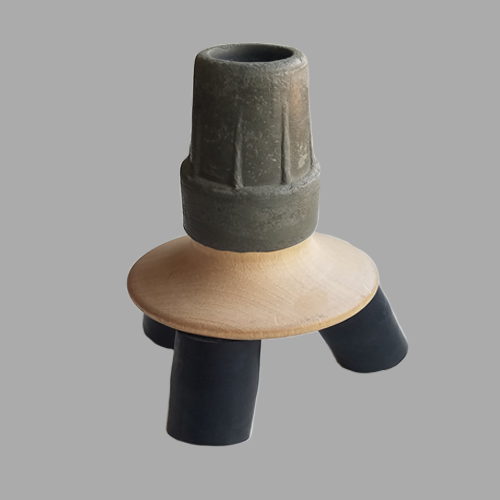 He took door stop pieces to develop a tripod base for the end of his father’s cane. Bud’s father instantly became more stable and secure. Bud thought his new device would not only help his own family, but could help so many others. Together with the help of his friend, Leland Girard, the Cane Flexi-Tip® was created. They went on to develop other products such as our Crutch Flexi-Tip®, Groove Grip, Combo Cane®, Bariatric Combo Cane® and Cruisin’ Crutch®. After Leland’s passing Dr. 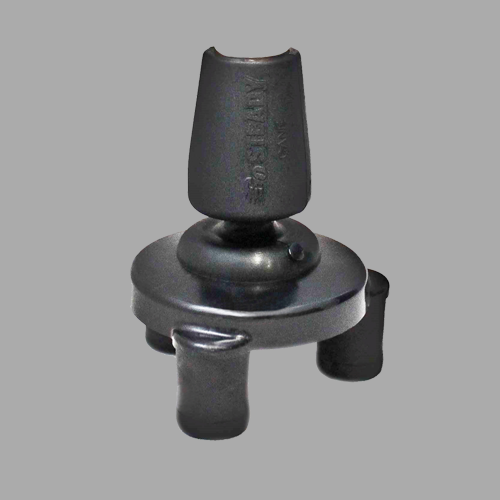 Bud developed the Tuffi-Tip®, which is a more secure alternative to the rubber tip other companies provide on most canes. Dr. Bud created a tripod design even on this smaller tip. In 2010, Bob Hendricks, met Dr. Bud near his home in Wisconsin where he was selling a tractor, so my dad stopped to chat. Bob Hendricks was always referred to as “farmer Bob”. He had a passion for helping others grow. Bob learned about the Flexi-Tip products and other inventions Dr. Bud had created. Bob Hendricks purchased the company in 2010. With very few sales under Dr. Bud’s belt Bob believed he could help plant some seeds and grow the business idea with such innovative products that could help others. The idea of making individuals with physical challenges more mobile and secure got him excited. 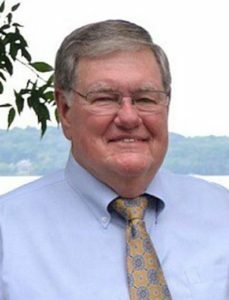 Bob Hendricks also saw the opportunity to teach his young grandchildren the ins and outs of creating a business and to help others. In the early stages of Go STEADY, Bob worked with his chiropractic friend, Dr. Patrick Livingood. Dr. Livingood was the first Go Steady supporter and helped connect individuals with the Go STEADY products. For several years these contacts and online sales were the mainstream of our business. In 2012, we began working with a leading supplier of private label products to retail, mass merchandise and pharmacies around Canada. We also provide our products to direct medical equipment providers/suppliers, catalogs and distributors. In 2015, Bob started training Jason Wyeth, who manages our product sales. With Jason’s help Go STEADY has been able to make our products visible at medical trade shows, increasing awareness and thus increasing sales. Since then we have increased our sales from our humble beginnings, but more importantly we have helped change the lives of those looking for more mobility and security one step at a time. Bob Hendricks unfortunately passed away unexpectedly in May of 2017. Bob’s daughter Beth Murphy has stepped into his very large shoes to fill. Bob taught Beth and their team the great values of life; passion, empathy, positive mental attitudes and desire to help others. Now his daughter, “farmer Beth”, will continue to focus on giving more individuals with physical challenges more mobility, stability and confidence to enhance their lives. Bob spent his entire business career in the field of finance. Becoming a part of the Go STEADY® team has given him an opportunity to help people by applying his financial and business experience. After graduating from the University of Wisconsin in 1966 with an MBA, Bob joined the Continental Bank in Chicago. He eventually became a member of the Bank’s Stock Selection Committee responsible for investing over $3 billion in common stocks. In 1985, Bob co-founded HOLT Value Associates, a financial consulting firm advising money managers around the globe. In 2002, HOLT was sold to Credit Suisse, one of the largest investment banking firms in the world. Bob officially retired from Credit Suisse in 2009 and immediately joined the Go STEADY® team. Bob’s business mission was to help people with disabilities improve their quality of life through innovative products designed to enhance their mobility, balance and safety. An inventor extraordinaire with dozens of patents to his credit, Dr. V.C. “Bud” White has turned his creative mind to helping people with mobility challenges. His professional and educational background makes him uniquely qualified to produce patient products from a Doctor’s perspective. Dr. White has written the textbook “Not Just Another Spring Beyond Bio-Mechanics to Bio/Analytic Mechanics”, is a member of the AAO, the Midwestern Society of Orthodontics, a Fellow in the World Federation of Orthodontics, a Fellow in the IAO, a Senior Instructor of the IAO, a Senior Instructor of the AGD, a member of the ADA, a member of the WDA, a member of the A.O.S., a Fellow in the VECTOR III Orthodontic Society, and a member of the American Society of Bone & Mineral Research. He was graduated from Loyola University Chicago with his Bachelors’ Degree in Engineering and went on to receive his Masters’ Degree in Orthodontics and Anatomy and spent 9 years teaching with Dr. Joseph Jarabak. Dr. White was also awarded the Milo Hellman recognition for his work in “Spring Rate and Spring Design”. Dr. White’s 1st patent was obtained before graduating from Graduate School and has had a continuum of multiple patents in the fields of Medicine, Dentistry, Orthodontics and Laboratory Equipment. He has additional patents pending at this time. His master’s degree in Anatomy from Loyola University plays an important role in the design of our Go STEADY® product line of canes, crutches and soon to be announced walkers. Dr. Bud is an extremely innovative scientist. He listens to the needs of his patients and then uses his talents to find innovative solutions to those needs. The core of our new product development at Go STEADY® will naturally be client (user) feedback. Although a successful professional orthodontist by trade, his success was insured by the administrative help of his wife Donna. Leland is a mechanical/design engineer with over 50 years of experience in the field of plastic injection molding, extrusion, thermoforming, blow molding and various other related plastic processes. After attending the University of Wisconsin for 3 years and majoring in mechanical engineering, he was drafted into the U.S. Army and served 2 years as a helicopter crew chief for the 93rd Transportation Corps. After completing his tour of service, Leland went on to attend the Illinois Institute of Technology (IIT) in Chicago, IL to obtain a degree in mechanical engineering. Leland’s engineering background includes positions at Minneapolis Honeywell Regulator Co. where he was chief draftsman & manager of the drafting department; Dole Valve Company (currently the Eaton Corporation) as their process development engineer responsible for the design and development of the encapsulated coil project and, eventually joining his father in business and becoming president and owner of Clover Plastics, Inc./Clover Tool & Die Co.
To Leland’s credit, Clover Plastics secured the U.S. Navy contract for the design and manufacturing of the arming device for the Polaris Guided Missile as well as the elapse-time delay relay and 35 mm film holder for NASA and the Apollo Space Program. During his 25 years in business, Leland obtained U.S. patents in the medical field, food packaging, and in-mold decorations. It was also during this time that he became acquainted with Dr. Bud White working to develop and manufacture several orthodontic and medical devices. Leland went on to accept employment with Master Molded Products, Inc. in Elgin, IL as their R & D engineer where he contributed patents in insert-molding, in-molding of electronic control panels and in-molding of printed material used by the automotive industry (Chrysler Corporation) and several others. The combination of Leland’s engineering expertise, his relationship with Dr. Bud, and his own personal mobility challenges have all inspired him to design products that virtually eliminate the stress of falling and permits people with physical disabilities to “get up and get moving”.